Exploding Doughnut: Buying flowers for work. Normally I pick out a bouquet for myself. This time around, I bought flowers for my night-time university job. Here they are! Sunny chrysanthemums, inviting daisies, and soft carnations to greet students as they leave and enter our department. 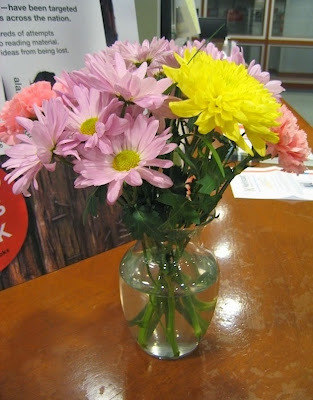 I think the blooms add a punch of color and life to the front desk and they make me smile when I walk past them. Why not share that with others? Getting (and giving) flowers RULES!